KUCHING: Four cases of Amyotrophic Lateral Sclerosis (ALS) were diagnosed in the state in 2012 and 2013, two each year. 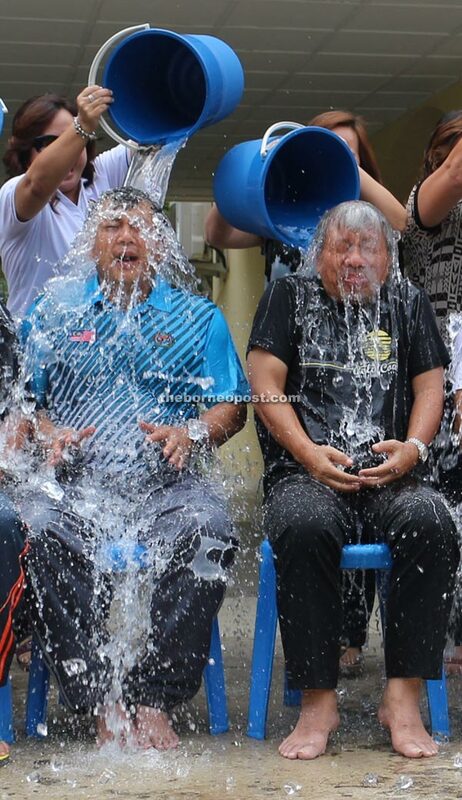 Masing (right) and Ulu Rajang MP Wilson Ugak Nyabong taking up the ALS Ice Bucket Challenge in Kapit on Saturday. State Health director Datuk Dr Zulkifli Jantan said ALS was very rare, and those inflicted would eventually die as there is yet no cure for this disease. “When patients are diagnosed with ALS, they will undergo treatment. But it is difficult to treat as there is no specific treatment to follow. “The chance of healing and recovering is low, and most patients eventually pass away,” he told The Borneo Post yesterday. He said ALS patients would become more paralysed as their muscles grow weaker each day. Dr Zulkifli said the only way for the public to help is to set up a fund, and all donations go to helping the patients accordingly. On the ALS Ice Bucket Challenge, Dr Zulkifli said it was a very effective way to raise awareness about the disease to solicit for funds. He, however, said there was no harm for those who are healthy to take the challenge. Participants would merely feel a brief moment of coldness as their bodies react to the shock of the icy waters. The ALS Ice Bucket Challenge first received attention on the social media in the United States of America in June when US President Barack Obama was challenged, but he declined and opted to donate instead. In August, some ministers in Peninsular Malaysia were challenged, and most of them accepted and donated, as well. The Borneo Post too was challenged on Aug 27, and after taking up the challenge it named Second Resource Planning and Environment Minister Datuk Amar Awang Tengah Ali Hasan, Local Government and Community Development Minister Dato Sri Wong Soon Koh, and Assistant Minister Datuk Naroden Majais. Awang Tengah said he would take up the challenge thrown at him at his own pace, while Wong, who had helped raise funds for a local ALS patient previously, opted to donate. Naroden, however, rose to the challenge with two buckets of ice water, but instead of donating to the the US-based ALS Association he donated to three local charitable organisations. Land Development Minister Tan Sri Dr James Jemut Masing took up the challenge in Kapit on Saturday and then donated RM10,000 to the Children Cancer Society.